iWindsurf Community :: View topic - The Grinches who stole Gorge winds finally RETURN it! The Grinches who stole Gorge winds finally RETURN it! Posted: Sun Jul 29, 2018 10:17 am Post subject: The Grinches who stole Gorge winds finally RETURN it! Despite the recent unusual heat wave winds at the Hatch and Swell the Gorge has had long periods of mild summer wind despite the epic winds of May. The phrase I hear repeatedly is "The Gorge is broken"
So what has caused the long heat waves and weak winds and where has all the wind gone? "Today, for the first time ever at Crissy, I rigged a 3.4. Finally after two day of being wildly overpowered on the 3.7, the 3.4 was like magic. It felt so normal and so good. "It’s just crazy. Three days in a row I could have sailed 3.4 at Crissy in July!!! Different day, same wind. And you can imagine the swell at the north tower. The gorge has moved south. Come on down. (my wife) on 2.8, (a friend who weighs 158) on a 3.0, Me (weighing in at 168) on a 3.4 Never would have believed this could happen if you’d told me in the past." 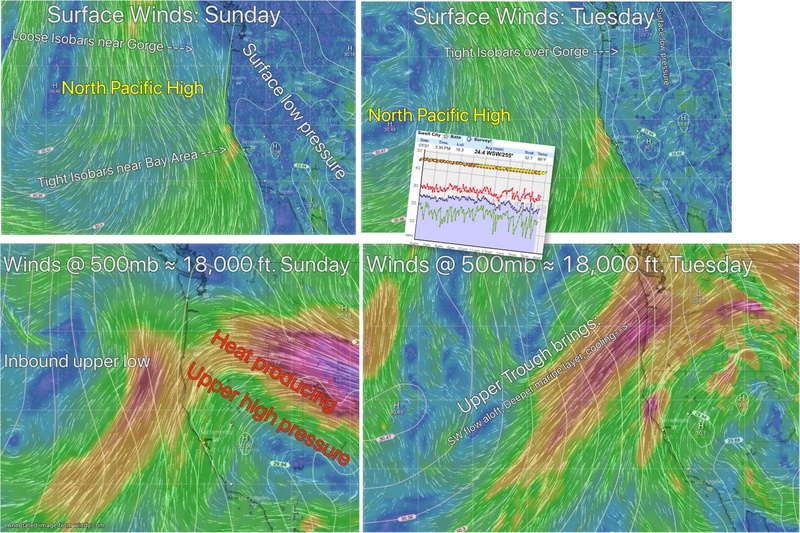 Your 2nd and 3rd hints are in today's model imagery below as is the most important hint ie. when the Gorge winds will return. So using those hints take your shot at explaining it all! Meanwhile, I will work up a blog covering all this in depth. Just a little context for the wind report at Crissy. It has been socked in with fog most of the month of July with very little wind close to the launch and freezing cold. There are a handful of intrepid sailors who shlog out to this nuking wind and are very skilled at both getting there and getting back. My hats off to them. I spent five days in the Gorge about a week ago. Two very windy gusty days and three warm days. It was so nice to be in shorts and not only enjoying a little windsurfing, but an awesome day stand up paddling, another awesome day on the mountain bike up at Post Canyon, and another awesome day exploring some waterfalls on the Washington side. Decades ago, I would have lamented the "lack of wind" but lately I have such a great appreciation of what a wonderful place the Gorge is to visit and spend time. Did you happen to be driving a ford f-150 with a santa cruz license plate surround? Glad you had a great time in the Gorge! But I think your post is sort of "preaching to the choir." Most of us moved to the Gorge because we came to the same conclusion you did: amazing windsurfing plus incredible beauty, biking, SUPing, hiking, skiing, snowboarding, kiting, kayaking and fishing etc. That said, most users of the Gorge iwindsurf site count windsurfing as their primary sports passion in the summer. And for most of us the Gorge winds have sometimes seemed mysteriously “broken” this season. Worse it has often been too hot for hiking, skiing and some other sports. So the intent of the post was not to put down the Gorge we love but rather to give Gorge folks some hints as to why the Gorge has had so such prolonged heat and often unusually mild wind this summer. And I would bet at times a lot of us would have gladly made a 3-day trade of our 90’s temps and brief winds for a Crissy 3.7 day and 50-degree air temps. And all of us would love to see the more of a Crissy type marine layer choking the western corridor like it used to do in our “Dawn Patrol” days. But having made that long Crissy slog many times myself I think most Gorge folks would skip that part of a trade. 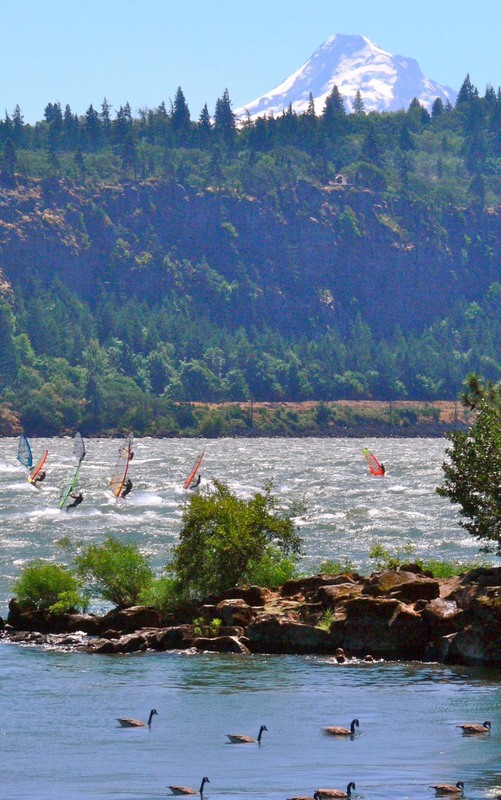 Enjoying epic windsurfing winds and appreciating the Gorge’s beauties and other sports are not mutually exclusive. Indeed one of many definitions of a perfect Gorge summer day is to ski Timberline in the morning, windsurf the Hatch midday and then kayak or SUP in the late afternoon. Yes, you can have it all in the Gorge! And today, finally, the Gorge has repaired itself with gusts over 30! Well, the Gorge appears mostly fixed today. 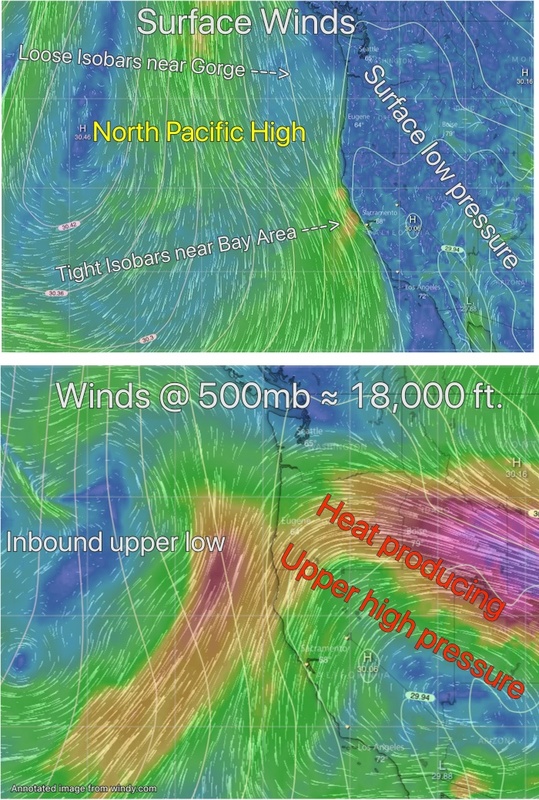 Compare the model output at the Surface and at about 18,000 ft. for Sunday vs. Today Tuesday. Notice how the heat producing upper high pressure is exiting eastward. Meanwhile, at the surface, the North Pacific High's is bars are now stacked over the Gorge making for a stronger pressure gradient. And also note how the inbound upper trough at about 18,000 ft. over the Gorge. And the upper trough brings a cooler deeper marine layer air to the coast and towards Portland making the Gorge pressure gradient concentrate in the corridor and it also delivers SW flow just aloft which helps our surface winds a bit. I think I also wanted to make sure that people don't think sailing those nuking Crissy winds are just stepping off the shore like the Hatch or Dougs. As you know, the southerly nature of the summer winds puts the Crissy Beach in a nasty wind shadow. If you are lucky, you can find usable winds just a few hundred yards from shore and worst case scenario a short swim at the end of your session. Right now, that wind line can be up to a half mile shlog. If you are not confident or capable of uphauling a 3.5 on a 85L, then you are looking at several hours of swimming with your gear or calling the Coast Guard for a lift home. Though the Coast Guard has picked up windsurfers and kiters at Crissy for decades, there has been a troubling increase in these rescues in the last few years by people who launched but couldn't get back to shore. A lot of these folks are often not regulars and are lured to this place by its beauty and tales of incredible conditions. Our relationship with the Coast Guard is becoming particularly strained as of late due to these avoidable incidents. I've been coming up to the Gorge almost every July for about 20 years. My observation is you are probably going to sail 5 of 7 days with probably 1-2 nukefests. That still seems to be the case but the biggest difference I've noticed is that dawn patrol doesn't seem to happen much anymore, which I always enjoyed since it was the least gusty part of the day. Also, the heat waves seem to last a little longer but often there is usable wind as well. It was 50 degrees and foggy when I left the house in a down jacket this morning. I sure miss eating ice cream at Mikes at 9:30pm in shorts. Well, I got 25 sailing days this July, missed 2 (getting lazy as I get old). Sailed every day (except 1) on that long "no wind and baking" stretch we just finished. Oups, forgot that the 5.7/6.2 freeride stuff is not really windsurfing. So, yeah, it was a very bad July. Besides all the other things to do, there's usually wind somewhere. When I used to drive up here from New Mexico for several months each summer, I considered "The Gorge" to include anything between Port Kelly and Newport, and drove all over as though gas cost well under a dollar, WSing was my hands-down top priority, and my van contained everything I needed. That often provided days or even whole weeks of strong winds that VERY few corridor hermits caught. Driving pays off, and today's data access reduces the crapshoot factor. Add all the other toys and activities, and even that infamous early '90s July that had two two-week stretches of nuthin' but heat in the corridor still offered plenty to do, often including WSing. I wonder how many of today's Gorge visitors even know where Jones Beach is, let alone how hard, steadily, and long (30+, like a fan, for many days on end) it can blow when the corridor (maybe even Portland) is baking and Astoria is cool. (Notice the "cool" word; JB can be 25-30 degrees cooler night and day than the corridor, and if it is, take your tiny gear.) I also wonder how many of them know how user-friendly Newport's Agate Beach, a mere 3-hour drive, can be even for sailors not accustomed to the ocean. I understand that over the course of a few seasons we are likely to see some of every kind of set up. But it seems like the frequency of the dawn patrol has been falling even on set-ups where it used to be more prevalent and reliable. Am I out of touch? Or is the dawn patrol really on the decline? And if it is declining in frequency - what do you think are the physical drivers?